I am testing the magnet spin lift by toppling the field axis end over end with a diametric tube magnet glued sideways to the axle of a synchronous wash tube pump motor; As Jerry Bayles does with his axial polarized disc. The field spirals outward along the "A" vector. The "A" vector in this schematic below, is in the center of the poles along the axis of symmetry. The schematic makes it clear that the "A" vector is the portion of the magnetic field that is PROJECTING AWAY from the source! You're on target thinking wise based on more recent discoveries of additional information that I located in the last 2 days. Anyone following this thread should be advised to also follow Allen's thread on the dollar store flying saucer challenge! You should be seeing at least half of a dual sheathed tornado in cross section with this image from Victor Schaubergers' Repulsin design. For those who care, the fine folks at Ultralight America did some significant work on "Spin Wave Repulsin Technology” pioneered by Victor Schauberger. 1.) The Coanda Effect, a pure aerodynamic effect based on the Bernoulli’s principal. 2.) The Electro Dynamic Effect: The high speed vortex in the vortex chamber produces an electric charges separation effect called “The Diamagnetic Effect”. *Note: This is a Superior Piece of Investigative Research. Well worth anyone's time in my opinion. I am not going to try to replicate here what has been already accomplished and by people whom understand aerodynamics expertly, and who've gone much further with filling in a complete understanding of what Victor Schauberger's Repulsin is about. "A lot of individuals have written concerning the design of the waveplates and Part 3 discusses the design with much detail. But I will include the following writings from Victor’s book to again verify the design. As the pages of the book show designs of waveplates, certain individuals who have no understanding of physics follow the saying “Monkey See, Monkey Do”. So if you build your waveplates like the ones shown in the book, then your doing exactly what others want you to do and your achievements will be a waste of time and money. The U.S Navy would never have let those pictures of the implosion motor be taken if the motor really worked. That particular motor was in the junk pile in Prague, left by the Russians. They got there first and had removed all pertinent data and information associated with the Implosion motor developments. Design and build by the information that has been given in my writings and your results will be fruitful." Find Articles in the header at the link. Spin Wave Technology for Mag Lev's. If you are a Rich person I may forgive you, but only so long as you buy their book, and then copy it for sharing. $490.00 from Jeff at Amazon: More money, more money, more money...Oink! Last edited by Gambeir; 05-07-2017 at 10:34 PM. Thanks ET Power. Not to take anything away from Otis or Hamel, because it's clear that there is a foundation behind those machines, and some of which may perhaps be seen in the ARV in the form of the pie shape of the capacitors. I've thought about some of the relationships of these and other ideas myself. Energy is concentrated at a point where the anther spin inwards towards matter in a decreasing spiral increases the acceleration which should then have a gravitational effect, or so it seems to me, and ideas like those which spring from people like Walter Russell were likely not unknown to the people that built the ARV and there is one interesting thing to note. Russell thought that gravity was the point of intersection of radiant light. So looking at those pie shapes, the way the machine appears, is as a kind of focused energy beam, and which comes to a point, and the fact that there is likely a magnetic field being applied in a spinning orbital plane at 90 degrees to a vertical electromagnetic power flow; well it sort of looks like a model of earth or something similar, and I could be all wrong with what I've thought and said previously. What we do know is that crystals/quartz is a driving force. This is about as well established as we can expect right now, but all parts are related, and it might well be I am only still seeing part of the motor system. In other words, the ideas of Walter Russel, Hamel, and others may well be incorporated in to the thoughts that went into designing the ARV. Some of them seem to be, but we do know that a vibrational fluxing of the crystalline material is a part of this system, or any other crystalline capacitor, for there is no other reason why it would have to specifically be a quartz crystal that I can think of. This would follow very conventional ideas about engineering the vacuum of space. See this. I've watched John Iwaszkos' video on this while taking notes and while stopping the video to draw out what he is showing. I think this is about the clearest understanding I've seen and with a physical demonstration. Just realize he's just using a piece of quartz and not a quartz capacitor. So the idea here is we/us/me, well at I am pretty confident that the base of this machine is series of 48 pie shaped quartz capacitors as described previously. We think that the pie capacitors fire off at high speeds in counter opposing manner so as to balance the machine with their thrust. They may also be driven in a cyclical or cycloid like manner, and at high speed, thus forming a vortex of pulsations. Reason being there is a probability of chance that there is a relationship to microwave/radar technology involved, and which may become more clear later on. Many, many, times I've thought that I've gotten this thing figured out only to discover more and more information. We have to realize that even though this machine maybe 50, 60, or even more years old, it's still a machine which was created by brilliant insightful people. Right now I'm looking for more information on EHD's (*Electro hydrodynamic generators) and also MAP's (*Maneto Plasma Dynamic Generators). I can speculate on the collection process but it's very thin ice. Normally I like to have a reasonable amount of support to my ideas, but here I'm lacking and in the process of discovery. Notice that in many UFO photos and video's there are areas where there appears to be kind of screening, or a part that seems to resemble a radiator or speaker cover. Something along those lines. In old machines like the ARV this has to do with the power system; the collection of ions from the surrounding environment. The environment is the fuel tank for the center column in my opinion. In newer machines it may have to do with creating a plasma shield. Right now I think that there is a super-conductive magnet or magnetic cables which, so long as the coolant lasts, is a part of a vacuuming system which collects ions from the environment. *However this is a big if. I have a lot to learn here and am still researching. It's unclear right now if this proposed vacuuming system involves the silvery grey like disk (*See the sketch I provided) and that disk is located beneath the pilots seats in the ARV drawing by McCandlish, but it could be a a type of super conductive/magnetic accretion disk. The disk would draw in ions which would then be feed to the tornado vortex for separation. Adding a electron to an uncharged atom makes a negatively charged ion, and removing an electron from an ion makes a positively charged atom. This is the purpose of EHD Tornado in the center column. It takes raw material, which is the surrounding environment, and using the vortex of a tornado it creates the potential for exploitation of these actions. Also note that John Iwaszko tells us that the hull shape is an important part of the capacitor drive, and even though it may not itself be part of the pie capacitors in the ARV design, at least as far we know right now, the preferred shape is that of a classic saucer, with the exterior of the hull carrying a positive charge and would then be a force multiplier. TRULY APPRECIATE all of your shared work/research & insights! no there's nothing wrong with humans. You have a distorted understanding if you believe that what's wrong in the world is the result of humanity instead of the result of perverted mental defectives, 99% of whom now account for nearly half the global wealth but whom number no more than a few hundred people. Like ya know, gates says he's trying to give his fortune away. Really, well let me help because i'm pretty sure that i can solve that problem and the world will be a hell of a lot better off without him and his friends hording half the monetary wealth while trying to accumulate more. You want to help solve humanities problems, then feel free to deliver a thermonuclear device to the next bilderberg meeting or the davo's bankster ball in switzerland next time; that ought to solve about 90% of the global problems in one feel swoop. Right now i'm busy trying to help people look at a 70 year old flying machine with more open eyes so that they realize just how badly those other people are screwing all the rest of us while parading around like they were some kind of kings instead of the criminals that we should see them as. you tell those crooked elite! Thanks, every little bit helps: I used what the folks over on Ultralight America had for an interpretation. Wonder how he ended up with that? magnetic but how exactly you end up taking a heating element and turning that in to a magnet with a word translation is hard to see. I did think about verifying the translation but passed it off as improbable that the author would be far off. Last edited by Gambeir; 05-09-2017 at 11:51 AM. Spinning a neo sphere on it's polar axis. My wash tub pump motor is apparently running at too low an R.P.M. to generate a detectable "Magnet Wind". Here's a possible alternative approach with higher speed potential. TK's "A" vector would expand to the side. Nope. It's the degaussing coil from an old monitor, and it's driven by a symmetrical square wave from the FG at about 40 Hz. The "secret" is in the orientation of the coil. Last edited by Allen Burgess; 05-12-2017 at 01:54 PM. The invention, which is the object of my present application, is a spacecraft propulsion system which develops a spacetime curvature tension utilizing a combination of a rotating radial electrostatic field and a fixed vertical electrostatic field. The two fields create a stress-energy Tzr gradient in the radially direction which is equal to force. The radial field is created on the side of a charged rotating cylinder on the underside of the hull. The vertical field is created by an annular charged ring concentric with the cylinder. Three rotating cylinders are located in a triangle on the bottom of the hull in order to produce a force in any direction in the horizontal plane. Last edited by Allen Burgess; 06-12-2017 at 02:39 PM. The idea for this coil configuration comes from the observation of powerful thunderstorms, as described by physicist Dr. Richard Feynman in his Lectures on Physics, a copy of which is enclosed as a reference. Upon reading his explanation, I realized that the thunderstorm is actually a hyperspace physics phenomenon. After the passage of a large lightning storm, people have observed that a car tire rim has merged with the trunk of a tree growing in the ground. Due to the large branches of the tree, there is no possible way that it could slide down the branches and around the trunk. It was observed also that a straw of wheat became embedded in the hard wood of a telephone pole. It turns out that the thunderstorm offers an explanation as to how this can occur. After reading Feynman's explanation, it can be seen that the key to this phenomenon is that there is a downward and an upward lightning bolt, sometimes occurring together if the leader branches into two paths. Bolts of lightning also like to strike tall objects such as telephone poles or trees. Now an electrical current moving downward produces a clockwise magnetic B field, as seen from above. On the return stroke, the current is moving upward which produces a counterclockwise magnetic B field. Thus the thunderstorm produces two huge bucking magnetic B fields which is the magnetic geometry of this magnetic vortex generator. Using my tetrahedron diagram, I will then show that the low density hyperspace energy with its low speed of light is able to pull the rim out of dimension so that it can merge with the tree at the moment the lightning strikes. Excellet work there Allen. Kind of throws me for a tizzy right now: Maybe will make more sense once I digest it more. Right off the top of my head the explanation given makes sense out of the Hutchinson Effect; seems like the Philadelphia experiment, Montauk, and others might not be that far fetched after all huh? Maybe that PDF link I sent you wasn't so wacked out after all? Now I have been working to piece together a more complete understanding of nuclear spin states and their relationship to crystals and ferromagnetic metals. Specifically beginning with the Wallace inventions. See this link on the topic. Excellent information on the Wallace inventions. The Wallace Inventions, Spin Aligned Nuclei, The Gravitomagnetic Field, and The Tampere Experiment: Is there a connection? "Wallace's experiments were based on aligning the nuclear spin of elements and isotopes which have an odd number of nucleons. These materials are characterized by a total nuclear spin which is an odd integral multiple of one-half, resulting in one nucleon with un-paired spin. Wallace drew an analogy between the un-paired angular momentum in these materials, and the un-paired magnetic moments of electrons in ferromagnetic materials." "Ferroelectricity, property of certain nonconducting crystals, or dielectrics, that exhibit spontaneous electric polarization (separation of the centre of positive and negative electric charge, making one side of the crystal positive and the opposite side negative) that can be reversed in direction by the application of an appropriate electric field." You guys may want to examine this white paper on Crystals. Last edited by Gambeir; 05-18-2017 at 10:20 PM. I say this because it occurred to me that what I've posted could be mistaken for plagiarism, low level plagiarism, but plagiarism nevertheless. "8. The use of a magnetic vortex generator located above each thruster in order to permeate the cylinders and rings with low density hyperspace energy which would substitute for the embedded magnets in each cylinder." Last edited by Gambeir; 05-18-2017 at 10:38 PM. Apparently those patents were released yesterday. They confirm everything we've theorized about. I got some apparent lift this morning from the diametric magnet attached to the end of a wash tub pump motor. I initially was holding the magnet on the perpendicular to an overhead plastic dinner plate. I realized I was on the wrong plane , and when I re-tried it side ways, Lo and behold, it began to lift the plate as I pushed upwards towards it! I need to try it again with a barrier to make sure it's not air lift, but it's an exciting result nevertheless. Last edited by Allen Burgess; 05-19-2017 at 05:18 PM. "A' vector wind hood test. I covered the wash tub pump motor and neo tube magnet with a ceramic pot, and got the same lift effect on the plastic dinner plate suspended overhead; So it's definitely the magnetic vortex supplying the lift not he air draft. The plastic plate is non-magnetic, but there's a "Lenz Effect" from the magnetic vortex that generates an electrical field. This is causing a powerful static repulsion. I saw a TR3B in 2009/2010 leaving the Scientology Center in Hollywood, California.. it was only 10:30pm or so at night... It slowly hovered above the Scientology Complex and then like a streaking light in Star Wars/Trek, etc... it took a 90* angle and was off into space-time/transdimensional travel. It had an orange *PLASMA* glow from the bottom center. I swear under penalty of perjury for forgoing facts are true. You're the man Gambier and onto it!!!! Actually I think it's Allen that's the man but thanks. As for your sighting, well I've seen one myself quite clearly for about 2 or 3 seconds, basically hovering over the house a few thousand feet up and it also took off at a several thousands of miles per hour. I'm guessing mach 6 or higher. Really it was so blindingly fast that no human eye could track it. At 32 frames per second you're going to get 2 or 3 frames in that one second with which to decide if you've actually seen something, so unless you see it sitting still you're just not going see the thing because it's moving that fast. Totally believe you ET. There was a good video captured recently of a triangular craft like the one I saw. That one was captured over Mt. Baldy in California. It was a ways off, but clear and the best one I'd seen so far, but then the poster removed the video after only a couple days and there are no copies on Scrub Tube. I asked the poster if he was visited by men in black (gov-corp stooges) and he just said to forget about the video. That it must have been swamp gas, a balloon, his imagination. We got er figured goons...so just give it up: We is hip to the trip now. I feel it's coming together now. That we have a solid idea how it works and what the primary parts to the machine are. It's just a matter of time now. People have the information now. They cannot stop the outcome any longer. Last edited by Gambeir; 05-21-2017 at 05:17 PM. I don't know what to say Allen....Amazing! Just fricking Amazing. You're the man....very inspirational work Allen. This is because of the Gadgetmall Coanda ya know. So that is now a virtual success story really. Starting to come together for me mentally now. Took time to study the first patent and now see clearly, I think, the links to the ARV's system. I am now studying the second patent. I know you're right about this: It's the magnetic vortex and Pyrolytic Graphite. About 20 or so years ago, I was flying model planes and was a member of this club which was almost completely made up of Navy Fighter Jocks and retired aerospace engineers. So I bulit a model of the F-117 and took it to our little meeting where I was naturally required to blab about it. Well so I'm giving one my typical dangerous armchair ideas about the materials used in stealth, at that time largely unknown, and I said that I thought the fuselage was carbon fiber. Fortunately, in a rare moments of lucidity I thought to ask a brilliant engineer named Dan Simenson what he thought. Simenson, then in his 60's was a retired engineer whom primarily worked on spy satellites. This was a brilliant individual. Well long story short is that inside of 60 seconds we were all lost in the complexities of nuclear spin states and how this then meant that the material wasn't carbon fiber at all, rather it was a Graphite Composite, and that the Radar Waves inter-react's with the nuclear spin states of the graphite to deflect the electromagnetic waves. That is, there is a vector resulting from the incoming radar which because of the angles of the panels that make up the body of the aircraft, it's fuselage, there then is formed a reflected electromagnetic wave to another vector away from the aircraft, as opposed to being reflected directly back to the radar as with typical materials. Well needless to say, no one other than Simenson had any idea what in hell he was talking about. Not at that time, and certainly not me, but today I can at least now gather what Dan was trying to tell all us chimps...LOL! I suppose that most of what Dan left behind for the rest of us is still locked up vaults, but this here I post in his memory. Last edited by Gambeir; 05-21-2017 at 05:52 PM. Take a pencil (graphite) and cover the pie plate by drawing on it and then repeat the test. Depending on results there may be other possible arrangements. Mere outline of shapes and forms; pyramids, tetrahedrons, ect, or by formed shapes made with glued paper and again possibly covered once more in graphite from a pencil, or possibly without: Unknown which will serve best right now. *NOTE: It is known that the mere drawing of an electronic circuits can effect an result. Last edited by Gambeir; 05-21-2017 at 06:21 PM. Don't laugh....I am pretty confident this real, or something like it is. This isn't half as far fetched as some may imagine. Now then, the results of your first experiments makes sense based on the St.Clair patent below. I am studying this one now. I've posted a list of some of the St.Clair Patents. Undoubtedly there are more. Appears to be a pseudonym of some kind. So now about the results of a magnetic vortex are explained in the St. Clair Magnetic Vortex Generator. 4. In another patent application of mine entitled Magnetic Vortex Generator, it was shown that a rotating cylinder containing embedded and stacked bar magnets produces a negative mass and negative spacetime spring constant. It can be shown that this combination produces a small wormhole or interdimensional connection between our space and hyperspace along the centerline of the rotating cylinder. Co-dimensions of hyperspace have different physics constants. A low pressure region of hyperspace has a very low mass density and a very low speed of light. The wormhole allows this low density hyperspace energy to enter into our space and permeate the cylinder and annular ring. The permittivity is proportional to the inverse of the speed of light squared. The hyperspace speed of light, obtained from my tetrahedron physics diagram, is 8971 meters per second. The speed of light in our dimension is 299792458 meters per second. As shown by the enclosed reference calculation, the hyperspace permittivity is about a trillion times larger. Because the force is equal to this new permittivity times the electric fields squared times the area around cylinder, the force is greatly amplified by this increase in the permittivity of space." Permanent magnet propulsion system (*Battery NeoMagentic Wound Copper Wire Train as seen on Youtube) Know this one works for sure. Last edited by Gambeir; 05-22-2017 at 01:39 AM. "Two separate, but electrically connected, toroidal coils of differing radii, carry magnetic flux in opposite directions about their common centerline". Last edited by Allen Burgess; 05-22-2017 at 02:34 AM. Nail ejected from same arrangement. I know this will seem like a joke but it's not. Remember* Never apply full power first! I don't need you teleported off world. Later might be Ok, when we have idea what's going on, but not right this second. Understand? Now along those lines, Spacecase0 turned me on to this interesting site, which involves a real case of teleportation among other possible uses: Worth looking at for a couple reasons. One reason is the antenna system mentioned in the ARV, and in the St. Clair Patents, and the other is of course the potential for teleportation. Meaning what to watch for if you want to stay here with the rest of the pathetic left overs....snort! Humor, mind you. Here's a video on the experience. You will want to note what Gernon says about the tunnel he flys through at about the 1:45 mark in the video. I only have some cheap flat magnets which have the poles on either side of the flats so that's a hold up for me right now. I'd like to make a cylinder with bar magnets arranged along spirals. One which is capable of having a secondary tube inserted inside. Bar magnets simplify the test arrangements. It would seem that the St. Clair Patent was formed around experimentation with that arrangement. 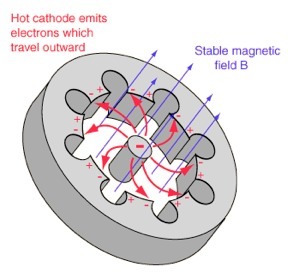 Which is beginning to explain why the core tube in the ARV is likely to contain an electrically conductive gas because it will be complex enough just using magnets. Otherwise, maintaining electrical contacts by some means, while having to deal with high speed rotating charged tubes will be an involved process. An electrically conductive gas would then be the best and most reliable form of charge carrier. As a suggestion; For a test purposes an old blender motor has relatively high speeds. I found one at a 2nd hand store so now I just need some good bar magnets. *Note: The purpose of the image shown is to illustrate how to lay out a spiral twist on a tube, and how to lay out the twist rate, such as 1 twist (*rotation) in 48 inches. See that in the drawing in the left corner of the image where it shows a vertical line drawn from the centerline of the tube and going down 4 inches, and from there going once more back up to the centerline of the rear of the tube. Along that vector layout a chalk line and roll the tube over the chalk. The PDF link shows how to make an antique barrel rifling machine, and therefore it shows how to layout and cut groves in turned wooden tube, which is information necessary for any accurate layouts of spirals on or inside of tubes, for it may be that laying out electrical lines or magnets inside a tube is better due to the rotational speeds and centrifugal forces involved. Last edited by Gambeir; 05-22-2017 at 12:42 PM. This invention relates to a magnetic vortex generator which has the ability to generate negative mass and a negative spring constant which, according to Einstein's General Theory of Relativity, is required in order to create a stable wormhole between our space and hyperspace. Two separate, but electrically connected, toroidal coils of differing radii, carry magnetic flux in opposite directions about their common centerline. According to Maxwell's equation, this produces bucking electric fields along said centerline. Because the two solenoids have different radii, the parallel spring constant of both coils is negative. The negative mass together with the negative spring constant produce a real resonant frequency which can distort the spacetime curvature due to the creation of powerful spikes of negative mass. This phenomenon, similar to the common electrical thunderstorm, opens up a wormhole into hyperspace through which low-density hyperspace energy can enter into our dimension. This energy finds many application in new types of power supplies, inertia-less and mass-less spacecraft, vehicles that can travel light-years by moving out of dimension through hyperspace, surgery-less medical tables, cranes for lifting heavy objects, cold-welded crystals for crystal rotors, folding space waveguides, and electromagnetic field propulsion vehicles using highly relativistic fields. Now if you look at the images from the folks over at Spacewarp on their science of Bruce Gernon's interupted journey, or accelerated one if you prefer, then there appears to be some support to this idea. an antenna, and applied to the exterior of machines then I suppose most people would try to explain it as writing or some kind. Last edited by Gambeir; 05-22-2017 at 08:11 PM. This is interesting to scan over. It's a study on how to possibly simply the visualization of vortex's in 3 dimension by using multiple micro-magnets. Thee are some interesting effects noted in the study on the properties of multiple spinning magnets. A discussion here on optical vers photonic band gap. I apologize to all of you because, ya know, I'm a pretty simple guy. Not educated in this stuff at all, so it's hard for me to link up the technology to construct a case. As a result, I've been slow to comprehend the totality of the Alien Reproduction Vehicle. This shouldn't be all that surprising since this is essentially a very early machine, and like many early machines the arrangement of the components isn't likely to be advanced. A comparative history of the evolution of machines shows how as the understanding develops then so too do the machines themselves. In other words, to use an analogy here, it's actually easier to understand how an airplane like a piper cub flys than it would be to try to understand how the wright brothers first plane flew. Gravity Waves and the ARV's Antenna System. What I had previously thought was a kind of atmospheric vacuum, and collecting ions for a fuel source, now appears to be incorrect. Mark McCandlish said that he thought the ARV had an antenna; which was this ring which forms the base of the platform where the crew door appears, and evidently this idea is well founded. A reading of the St. Clair patents shows that this ring like structure is a type of antenna. It's evidently a component of a gravity wave drive system. The authority on Gravity Waves, aside from Einstein , and whom we can't talk to so far as we know, appears to be Dr. Robert Baker. And other additional video links there as well. Now there are a plethora of issues going on here as a result of this latent epiphany and which should actually concern everyone everywhere. Too many to be brought forward here in total, but these include; Sub-space communications, almost certain to be in use right now, contrary to what the Jason Report by the Federation of American Scientists would have you believe. Dr. Baker releases this volume as a primer that presents the most basic elements of gravitational waves. Now this ...this is an interesting paper for someone like myself because you may recall how I mentioned that the first people to take note of antigravity effects were those scientists whom designed and witnessed the first atomic bomb tests, and what this suggests, as was hinted at in Dr Steven Greer's movie; "Disclosure" is that these nut cases have disturbed or even damaged civilizations far and wide across the galaxy by sending a gravitational shock wave across the proverbial universe: One can only imagine what other advanced societies may think about humans if this is the reality, and it does seem to look like that is the real motivation for alien visitations: Insane people with too much money and not enough brains and whose wealth and power is all based on creating fear, war, and death isn't likely to be a successful pathway to advancement or even survival. If not by our own hands than by others if necessary. So now the reason I've posted all this really has to do with a tiny bit of obscure info, now mostly scrubbed off the net by enemies of humanity, and that happens to be the Chris Hardeman Experiment. Last edited by Gambeir; 06-04-2017 at 06:36 PM. As this information seems to grow legs on a regular basis I'm gonna post these images so that some may choose to safeguard them as they see fit. This is the crop circle Chris based his experiments on. Barbury Castle Crop Circle 1991. Generally speaking, it seems as though every lunatic has taken the image of the Barbury Castle Crop Circle and somehow or other self-constructed the second coming of Jesus Christ. Don't be deceived because even to someone like myself, a completely ignorant person electronically speaking, this is an obvious depiction of a microwave cyclotron, and we all know that microwaves have of course long been associated with UFO's and cropcircles. Now the problem with the Haldeman experiment is that it too is missing parts, just like so many others, and here I think one has to refer back to the St. Clair patents. Specifically this one. What's that in the middle of that cropcircle? A magnetic vortex generator? As an footnote; note how the information in this rather small image shows how some of these cropcircles have a great resemblance to Telsa's work. GBPPR Homebrew Radar Experiment Magnetron Pulse Transforme. Site probably contains useful information. One image link I've included. This link involves an extreme effort. It's worth examining in detail. I may comment on this further later, but posting it for reference and so that I don't forget all about it. The field drawing showing a steel ball is nearly a replication of plasmoid, another antigravitational plasma which has been invading our skys for quite a while, but much more commonly as of recent and is often mistaken for a UFO. Last edited by Gambeir; 06-04-2017 at 06:33 PM.